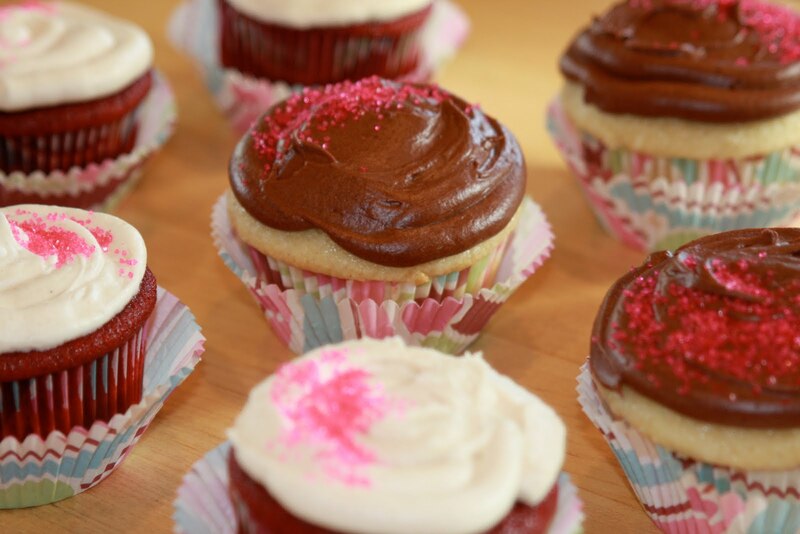 There really should be a fifth food group, and it should be dedicated to the cupcake. Seriously, though–who doesn’t LOVE a cupcake?! Delicious joy, wrapped up in a tiny little package. February is full of birthdays (apparently June was a busy month for some folks) and I’ve been experimenting with birthday cupcakes for friends. While the experiments have been a total snooze-fest (insert sarcasm here…wait…while I lick the frosting out of this bowl…), I have come upon two new favorites that I want to share with you (as if anyone but my mom is actually reading this thing). Firstly…red velvet. Me likey. Many recipes render a tough, hockey puck type cake but I found one that is pure perfection. It’s from one of my favorite blogs by Joy the Baker (she rules!). The cream cheese frosting quite literally is “the icing on the cake” here. And secondly, many of my friends are on crazy gluten-free, no wheat, no dairy, no fun diets. I attempted to make “I can’t believe they’re not cupcakes” to accommodate various dietary restrictions, but the ingredient list promptly spiraled me into financial debt. I ended up going with a mix, by Bob’s Red Mill and I have to say….it ain’t too shabby! It’s quite tasty, actually. So enjoy a sweet treat, it’s sure to brighten your day!